Care must be taken when interpreting capacitance values since these are measured at room temperature under small signal conditions. When an actuator is driven at full range, hysteresis exhibited by the piezoelectric material results in higher current flow. The effective capacitance at full-range is typically factor of 1.4 to 2.0 times the small signal capacitance; therefore, the effective capacitance is usually considered to be twice the small signal capacitance when the actuator is driven at full range. In addition to capacitance non-linearity, piezoelectric ceramics are also temperature dependent. The sensitivity and capacitance of common piezoelectric actuators can double with every 50 degrees Celsius increase in temperature. If the ambient temperature is above 25 degrees Celsius, the capacitance increase should be considered. 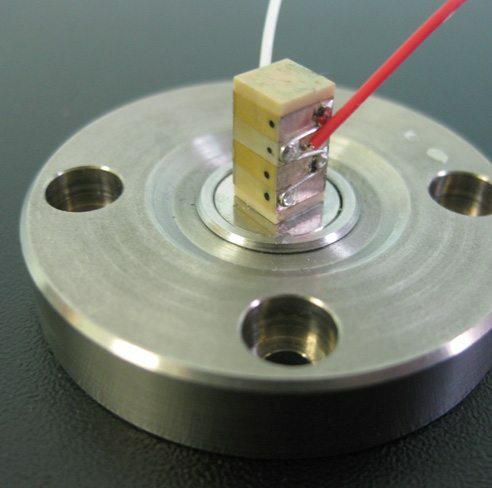 Large temperature increases can also occur when driving piezoelectric actuators at high-speed or full-range. The spreadsheet below calculates the maximum current and slew-rate requirement for a capacitive load. The spreadsheet does not take all operating conditions in to consideration and should only be used as a guide. More detailed specifications can be found in the amplifier datasheets. where \(C\) is the capacitance and \(V\) is the voltage. If a sinewave spans the full voltage range of the drive, the maximum frequency sinewave is also referred to as the power bandwidth. The output voltage range is the first consideration to be taken into account when selecting a drive for piezoelectric actuators. To achive maximum displacement, the drive should be capable of developing the full rated actuator voltage. Popular monolithic stack actuators are available in voltage ratings from 60V to 200V. This rating is the maximum positive voltage or coercive field strength that can be applied. Although higher than rated positive voltages will generally not damage an actuator, excessively high voltages may result in arcing that can erode the actuator and cause intermittent short circuits. Piezoelectric actuators can also tolerate small negative voltages. This will increase the actuators range but extreme care must be taken not to depolorize the dielectric. Most piezoelectric dielectrics can tolerate a negative voltage of approximately 10% to 20% of the maximum positive voltage. 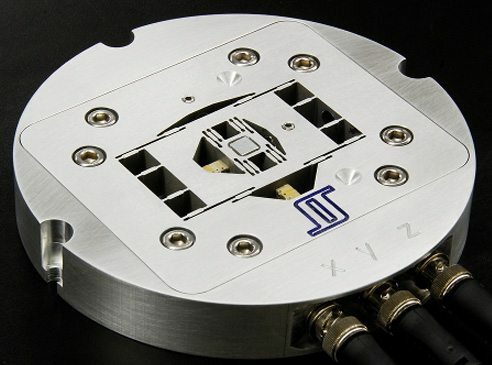 High-speed nanopositioner developed at the EASY lab, University of Nevada, Reno. When considering small signals that do not exceed the current limit, the maximum operating frequency is dictated by the driver bandwidth. The bandwidth is the frequency where output power has reduced by a factor of two and significant phase-shift is present. For accurate signal reproduction, input frequencies should generally be lower than 10% of the driver bandwidth. As load capacitance is increased, the bandwith of a piezoelectric drive reduces. This relationship between capacitance and bandwidth can be found in the drive’s datasheet. A typical frequency response characteristic is shown on the right. Piezoelectric drives produce hazardous potentials and should be used by suitably qualified personnel under the supervision of an observer with appropriate first-aid training. Do not operate piezoelectric drives when there are exposed conductors. Use appropriate signage for Hazardous Voltages. A more detailed discussion of piezoelectric drive limitations can be found in the following references.